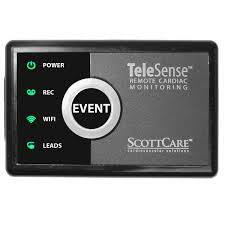 Scottcare is proud to introduce their second generation mobile cardiac telemetry (MCT) monitor called the TeleSense™. The new version of their mobile cardiac telemetry monitor offers great flexibility in terms of monitoring modalities as it is capable of performing a 24 hour Holter monitoring study, cardiac event monitoring & mobile cardiac telemetry monitoring. The TeleSense™ monitor is much smaller in size compared to the previous version TeleSentry and offers the ability to run on any cellular network through mobile WiFi. The TeleSense™ device has many programmable modes which can be performed in the clinic or executed remotely.